Displays black weapons as a replacement skin for the default weapon skins. Extract the files from the ZIP file using WinZip or WinRAR, and place them anywhere on your desktop for easy access. Navigate your way in your C:\ drive (or what ever drive is your primary drive, you used to install C&C Renegade, normally C:\) and go through \Program Files\ (or \Program Files (x86) if you are x64 bit), then go to \EA Games\ and find your First Decade or Renegade folder, open it, find Renegade, and go to your data folder. You're finally here! Extract everything from the .ZIP file and place the files here. You're done. If you require assistance on installing skins, you can always post in the Help & Suggestions board, and there will be many people willing to help. Displays Scrin-type weapons as a replacement skin for the default weapons. Displays a GDI APC Vehicle Pack, with a blue stained-glass look, only a physical effect, as a replacement skin for the default GDI vehicles. This skin pack includes Dreganius's vehicles & Crazfulla's crate. GDI: Hummer, A.P.C., M.R.L.S., Medium Tank, Mammoth Tank, Orca, Transport Helicopter, Harvester. 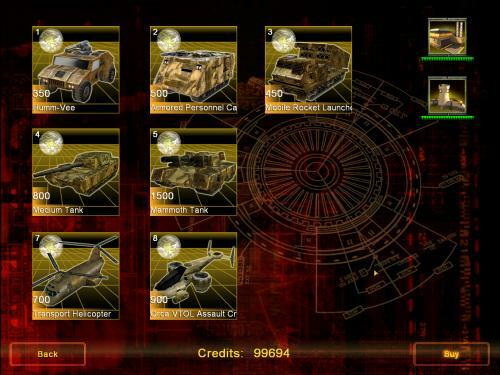 NOD: Buggy, Recon Bike, A.P.C., Mobile Artillery, Light Tank, Flame Tank, Stealth Tank, Apache, Transport Helicopter, Harvester. Renegade: Tiberian Dawn (C&C 95) Pack 2.0 changes some skins and adds a bunch of sounds to bring the atmosphere of Tiberian Dawn. Sounds from CnC Tiberian Dawn (Cnc95) such as: Ion Cannon strike sound, minigun/machine gun shooting sounds, cloaking sound etc. Thanks to all contributors and to Westwood Studios. UPD2: there are 2 versions of the Flame Tank skin - one being Bazil's version and the other being part of ArtyWh0re's (orca234's) Grey Camo Nod Vehicles Pack. You can see the former version in the first screenshot (above the text). IMPORTANT: tank_stealth_start.wav in the Sounds folder is currently not allowed on MPF NewMaps. Replaces GDI characters with Mutant versions of themselves. Changes Dead 6 Unit's Uniforms. Changes GDI Characters Into Dutch Style Soldiers. Includes: Soldier, Engineer, Rocket Soldier, Shotgunner, Grenadier, Deadeye & Havoc. In an attempt to recreate a C&C 95 feeling, this pack gives all Nod vehicles a grey camo like in C&C 95 while maintaining the detail of each vehicle. This pack of skins includes files that will help lower FPS lag for people on slower, older computers. NOTE: These skins may be BLOCKED by other servers outside of MPF, make a note of files' names incase you have to remove to play on other servers. To install: Extract from .rar to your Data folder. Affects both GDI and Nod Advanced Character Icons Includes the all Alternate Skins as well!